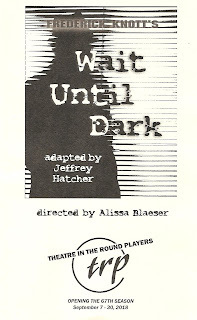 I first saw Frederick Knott's 1966 classic thriller Wait Until Dark, adapted by local playwright Jeffrey Hatcher, at Lyric Arts two years ago. The second time around, at Theatre in the Round aka the Twin Cities' oldest theater, may have been a bit less suspenseful since I knew what was coming, but it's still a thrilling story of a blind woman who outsmarts the criminals trying to do her in and uses her sightlessness to her advantage. 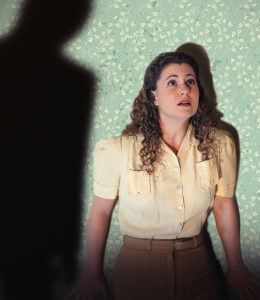 A story like this relies on precise lighting effects, and lighting designer Sadie Ward accomplishes it well within the limitations of the space. I couldn't help wishing it were darker (light from the EXIT sign and other ambient light keep it from being pitch black), but it's still pretty cool to experience a little of what Susan does, when you can't really see what's happening on stage and have to rely on the sound of voices and footsteps. The script very specifically mentions stairs up to the apartment door, which are nicely accomplished here by using the stairs into an aisle of the audience, although from where I was sitting I couldn't see the comings and goings from the upper door. Still, the all-important fridge, safe, desk, and kitchen counter are well represented and spaced around the stage (set design by Devyn Becker). Combined with mood music, the overall effect is chilling at times. The solid six-person cast is led by Heather Burmeister as our hero, portraying Susan's range of emotions from confidence and determination, to uncertainty and terror, but never weakness. Newcomer Alex Abdelwahed conveys the hurt behind the neighbor girl's brattiness, and her strength as she helps Susan. Parker Shook is sweet as Susan's husband, appearing only at the beginning and end of the play, as this is Susan's story of independance. The three bad guys are bad in the best way, from Ryan D. Maddux's smooth and charming Mike, to Andy Schnabel's tough-talking former cop, to Christopher J. DeVaan's truly evil mastermind, with a well-utilized scream of rage. 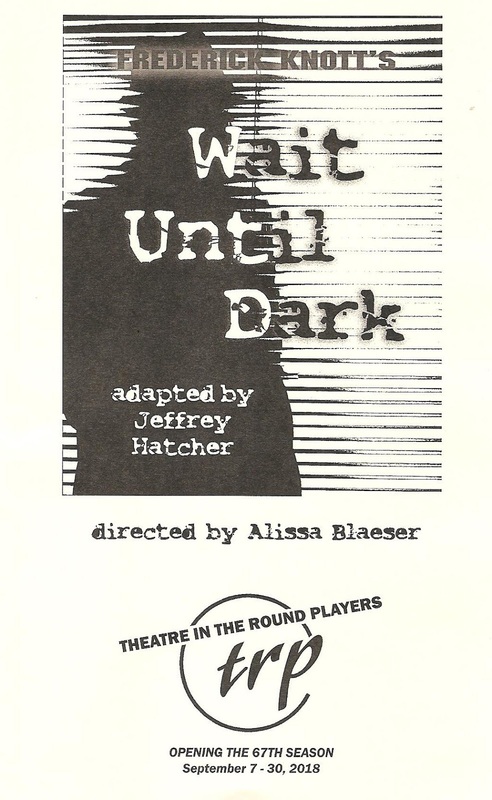 Wait Until Dark continues at Theatre in the Round through September 30. It's a solid production of a classic and entertaining thriller. *Plot summary borrowed from what I wrote about the production at Lyric Arts.